A side: BY THE DEVIL (I WAS TEMPTED). country: YUGOSLAVIA. RARE RECORD. record: VG (visualy graded). b side: I CAN'T FIND THE ANSWER. After the lovin' (despues de ti). M (Mint),EX (Excellent),VG (Very Good),G (Good),F (Fair),B (Bad). The first refers to the disc and the second to the sleeve. The abbreviations we use are as follows. Artist: ENGELBERT HUMPERDINCK. Title: LOVING YOU LOSING YOU. Label: EMI. Year: 1977. Artist: Engelbert Humperdinck. Label & Cat No: EMI EMI 2622. Title: I Believe In Miracles. Year: 1977. We try to provide the best image possible and we don't trim the photographs so you can clearly see the sleeve edges. Artist: ENGELBERT HUMPERDINCK. Title: I BELIEVE IN MIRACLES. Label: EMI. Year: 1977. Artist: ENGELBERT HUMPERDINCK. Title: LAST OF THE ROMANTICS. Label: EMI. Year: 1978. Format: LP. Artist: ENGELBERT HUMPERDINCK. Title: ENGELBERT SINGS THE HITS. Label: EMI. Format: LP. Country: UK. 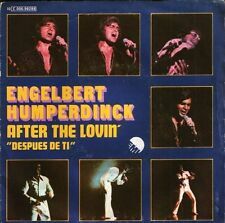 ENGLEBERT HUMPERDINCK. AFTER THE LOVIN'. MADE IN AUSTRALIA. RECORD IN VERY GOOD CONDITION. Artist: ENGELBERT HUMPERDINCK. Artista ENGELBERT HUMPERDINCK. After The Lovin'. Label: EMI. Condition: VG . I thought I had better start making a point of it in case it's left waiting too long.